I had to share these photos with you all...I am so proud of my girl. Big Sister's best friend in Boise has been fighting leukemia since just before Christmas. Our boys got to shave their heads to show their solidarity with Andy, but Sis didn't want to do that. I suggested she grow her hair out and then donate it to Locks of Love, in Andy's honor. She has patiently dealt with long hair, tangles, and my nagging to brush and braid it daily. It finally grew long enough to consider cutting it. Saturday, my soon to be sister-in-law did a fabulous job cutting her hair. Doesn't she look so grown up? Our little package is sent off, and hopefully will be used for another little one dealing with cancer. 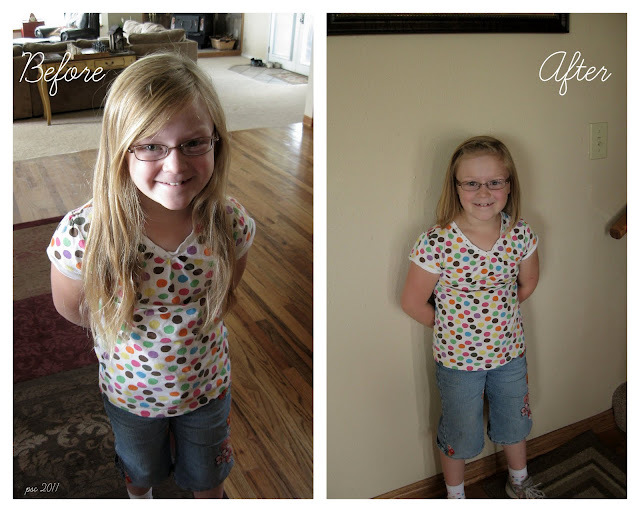 If you want more info regarding Locks of Love, click HERE. What a wonderful thing for your daughter to do... and I love her new do! What a wonderful thing for her to do! Cute haircut! What a lovely story! I'm sure that lovely thick hair will be appreciated. What a wonderful and special gift and a lovely hair cut. A proud moment for all of you. What a great example of generosity this is! Way to go Big Sister, you should be so proud of yourself! it's such a tender history! You must be so proud of your girl! I've donated mine twice and my 5-yr-old has once. You are so awesome. What a great lesson to teach and to learn. It took patience, love, and selflessness to do what your daughter did. A true friend. What gifts your children have given to their friend: gifts of support and also the gift of sharing. Good lessons for life! Well-done! I read this from work so long ago but couldn't comment (blogs are blocked). But I am still beaming with warmth, such humility and tenderness. Seriously priceless. Be proud Mom, be PROUD!